Temple Israel in Greenfield, Massachusetts commissioned Michael Singer for a permanent Ark for their new building. The Ark is set into the eastern wall of a two storey alcove with skylights. 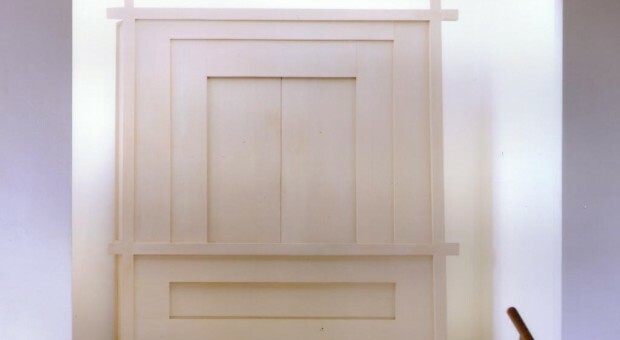 The bass wood material was harvested in Southern Vermont and is finished with a white transparent pigment. The interior of the Ark is lined with copper. All dimensions of the Ark components are based on the number ten, reflecting on the ten Hebrew words of creation. The Etz Hayim Congregation in Derry, New Hampshire commissioned a movable Ark to be used in a church they shared with a Christian Congregation. Their intention was to permanently install this Ark when they moved into a new synagogue. The Ark is constructed with clear bass wood and copper. Temple Israel in Boston is one of the largest reform congregations in the United States. The main sanctuary was built to overlook a large old maple tree that provided the background of the floor to ceiling glass wall behind the Ark. Disease destroyed this tree in 2004. Temple Israel commissioned Michael Singer for a new ark to commemorate this special tree. The Ark includes salvaged wood from the old tree. The interior of the ark is copper and the Hebrew words “aitz haiyim” (tree of life) are inscribed on the curtain.